Sometimes there are days when the only goal is to keep my daughter busy, so that she doesn’t have a chance to spin off into a meltdown. Today was one of those days. 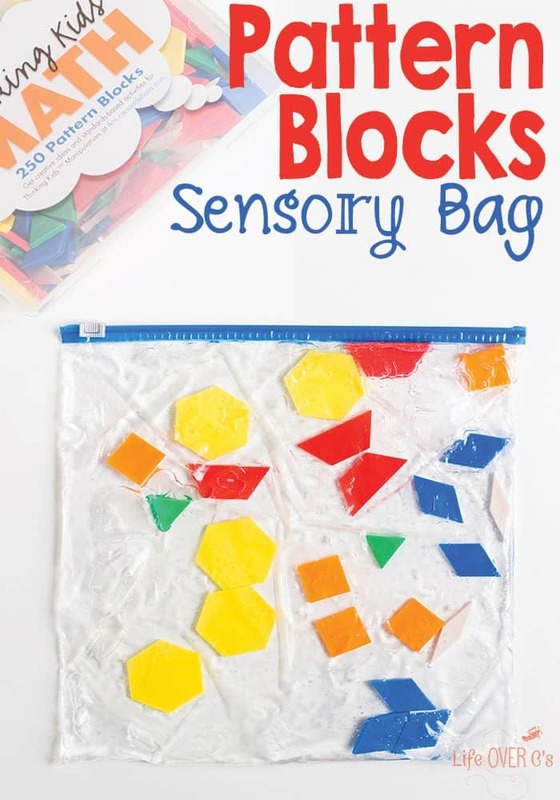 When we are having a meltdown day, I like to get lots of easy-prep activities handy like this super easy pattern block sensory bag. 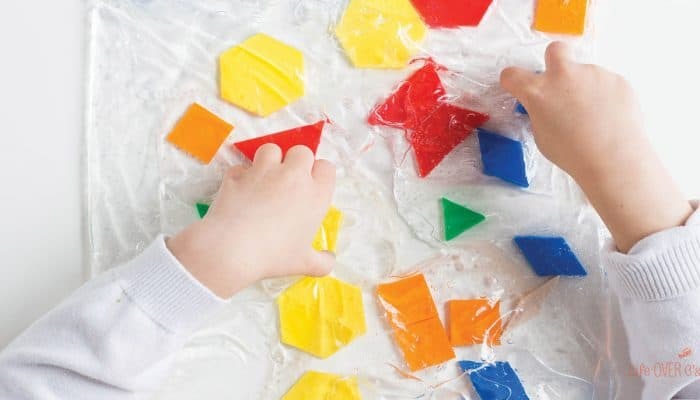 After we had played with our transportation dominoes, read some books, built towers with the foam blocks, and put together some foam puzzles and a plethora of other activities, we needed some more meltdown-safe things to fill our morning. So we created this! To prepare: Open the gallon-size zip top bag and fill with the clear hair gel. We used all of a 20 oz. bottle of gel. I’ve included a link to show you what it is, but you can usually find a bottle at a local dollar store. 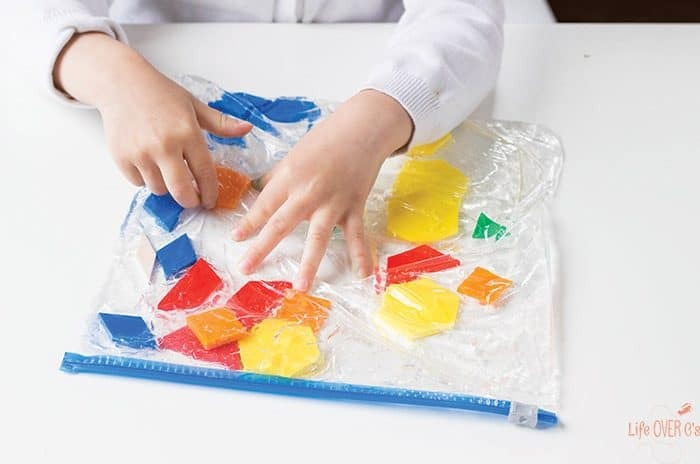 Then add some pattern blocks to the bag of gel. I was aiming for 4-5 of each shape, but my preschooler decided to help me, so I’m not sure how many we ended up with. I did avoid the skinny rhombus because I thought it might be too pointy. If she is having a really rough day, I would either put duck tape across the seal of the bag or place the bag into a second bag. Should you choose to use a second bag make sure that the writing on the outside of the bags is on the same side, so that you have one clear side to view the contents. Kids can squeeze them, throw them, push on them without fear of breaking something. They catch kids’ attention and can calm them down. 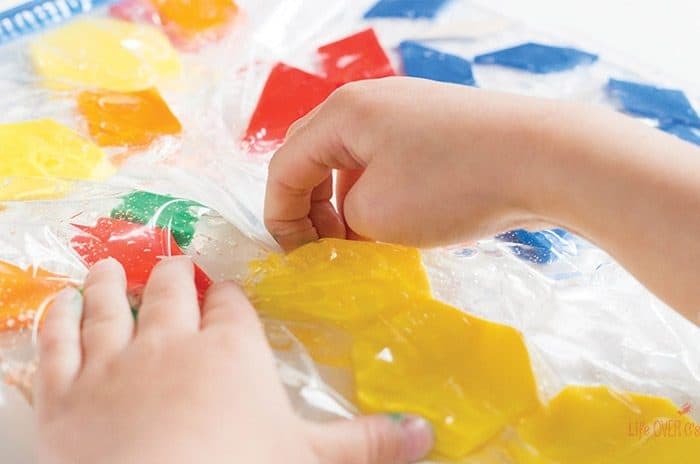 Bags, such as this one, are great for fine-motor skills while Shiloh pushes around the objects inside the gel. Fine-motor skills are especially important to use with Shiloh’s Rett Syndrome diagnosis. While most girls diagnosed with Rett cannot use their hands at all by age five, Shiloh still has full use of hers. She has a few quirks like layering fingers on top of each other, but in hopes of stalling future skill regression, we work to keep her hands very busy. Create pictures using the shapes. 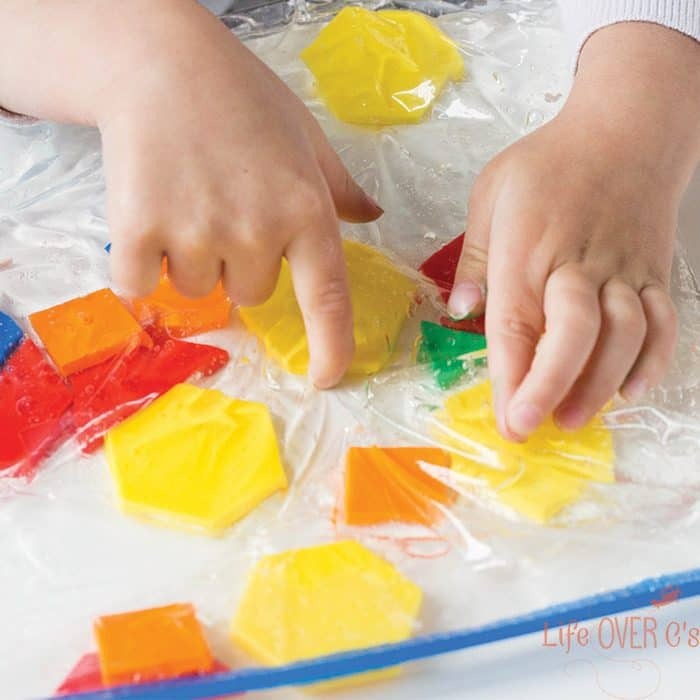 More Kids’ Activities You’ll Love!